Santorini is a popular destination when visiting Greece. The famed Greek island of Santorini is especially renowned for its sunsets, but some places are better than others for this evening ritual on the island. The short promenade along the cliff edge in the southern area of central Fira near the Cathedral is a popular sunset viewing location. Relax with a drink or bite at one of the many cliff-clinging bars and restaurants, also very popular. Some places may require reservations. Depending on the time of year, the sun may be setting beyond the island of Thirassia across the caldera, a large volcanic crater, and this means that your sunset will be a little earlier than for those watching off the tip of Oia. The town at the northern tip of the crescent of Santorini is Oia and is generally considered to be the best sunset viewing location on the entire island. Unfortunately, this also makes it by far the busiest sunset viewing location on Santorini. If you find crowds stressful, or the sound of three hundred cameras clicking away simultaneously annoying, it may not be the best choice for you, especially during the busiest summer months. This winery located in about the middle of the Santorini crescent has a long terrace with tables providing a great view of the sunset. Add in the opportunity to have wine and hors-d'oeuvres or enjoy a wine tasting in the small bar and you'll have a memorable experience. It's a dramatic, photogenic spot with a full view of the caldera and the volcanic islands of Nea and Kameni. Located at the bottom of the island of Santorini, this lighthouse is picturesque in its own right, but also offers a nice place for sunset viewing. Be prepared to park where you can and then walk on down to to the lighthouse. On the way to the lighthouse, you'll also encounter an old windmill base which also provides a great spot to see the sunset. The coastal road through the southern portion of Santorini, heading toward the west, has a number of spots providing a great view of the sunset over the caldera. The highest point on the island of Santorini offers a gorgeous view of the islands, dramatic at sunset. The drive back down the mountain in the near-dark may be challenging for some. The parking area for Ancient Thira, located farther down the mountain, can provide a pleasant sunset-viewing spot, though the ruins themselves will be closed at that hour. This village-topped island offers a different sunset view since it is not seen looking across the caldera as in the other locations. Instead, you'll see many of the Cycladic islands in the distance. You can also look back at the island of Santorini. Depending on the conditions, the distant white buildings painted pale pink with the sunset will make for great photographs. However, before you rush to Thirassia, make sure you have arranged a place to spend the night. Sunset comes too late to let you catch a boat back to the main island of Santorini, and there are only a few rooms available. This is one case where a spot in Greece can be truly "sold out." 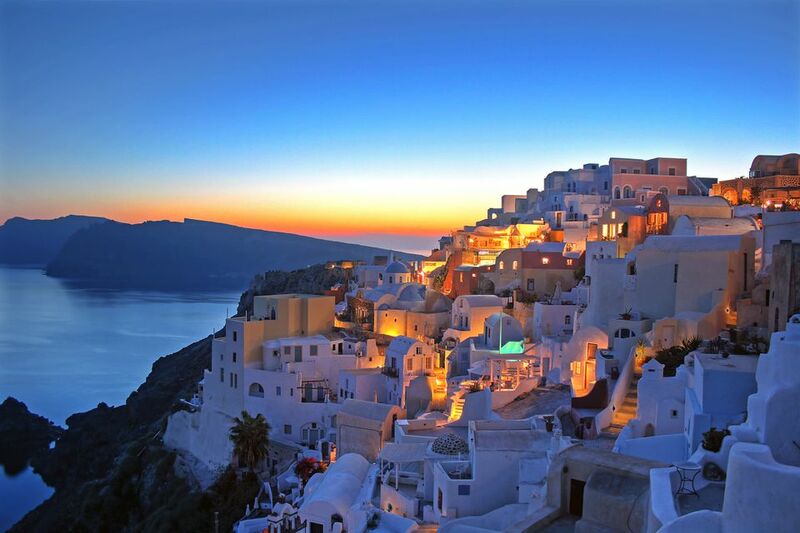 But what if you want to see the color show from the other side of the night, namely, a lovely Santorini sunrise? The clouds around Santorini will show color no matter where you are, but to see the beautiful sunrise, try the back terrace of the Hotel Aressana in Fira. Where Are the Temples to Greek Gods and Goddesses?